In many aspects this was a direct successor to the style of Rationalism as instigated by architects like H.P. Berlage. The most important architect of this group is A.J. Kropholler, others are C.H. de Bever, C.M. van Moorsel and. B.J. Koldewey. This is mostly a catholic group of architects, although protestant architects like B.T. Boeyinga and E. Reitsma eventually built in a closely related style as well. Catholic architects like A.J.N. Boosten, F.P.J. Peutz and H.W. Valk built churches in Traditionalist styles that differed from that of the Delft School. 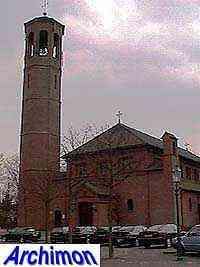 In the style of the Delftse School many churches were built, especially catholic ones. After World War Two the influence of the Delft School on church architecture soon diminished while its influence on profane architecture reached a height. A.J. 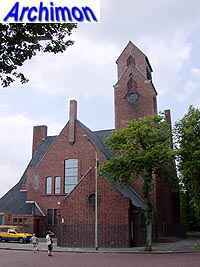 Kropholler built his first Traditionalist church (in Beverwijk) in 1914, which makes him one of the founding fathers of the movement. Since that moment he stayed true to this style. 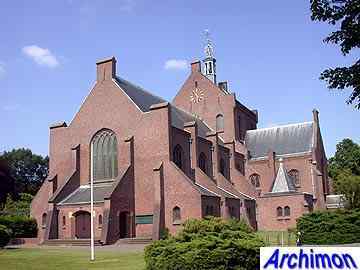 The St. Paschalis Baylon in The Hague (ZH) is representative of his work, with enormous buttresses, narrow windows and a minimal use of natural stone. Of all the Delft School architects Kropholler is the one who stays the closest to Berlage's style. The architects of Traditionalism are responsible for the design of most of the christocentric churches. These are churches that provide an optimal view at the altar without centralizing thanks to a wide pillar-less nave, narrow side-aisles and a higher but undeep choir. C.H. 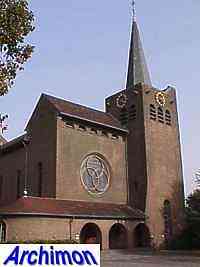 de Bevers St. Maria in Goirle (NB) from 1939 is an example of such a church in Delft School style. Other architects worked in a Traditionalist style that differs from that of the Delft School. H.W. 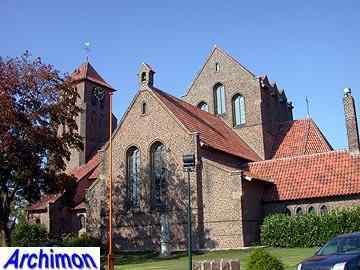 Valk for instance, who built several churches with Gothic and Romanesque influences, like the St. Michaël in Beek en Donk (NB) which was built in 1933-1935. This is also a christocentric church. One of the most original architects of Traditionalism is A. Boosten, whose early work resembles the style of the Delft School in some ways, although combined with a touch of Expressionism, while his later work features less conventional elements like towers at odd positions. The St. Barbara in Bunnik (U) from 1939 is representative of this architect's more traditional work which is otherwise mostly found in the province of Limburg. In the late 1940's a new Traditionalist movement was started. Monk and architect Dom Hans van der Laan and his brother Nico founded the Bossche School ('Den Bosch School'), named after a course for catholic church architecture held in 's-Hertogenbosch from 1946 until 1973. The Van der Laan brothers and their followers developed a style, inspired by early christian architecture and characterized by the use of simple geometrical shapes. 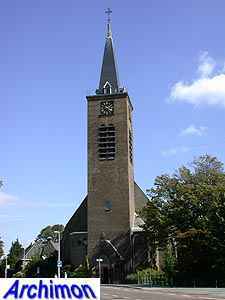 Churches in this style usually are wide buildings with a square or hexagonal tower in Italian Campanila style standing offset at the front, like the St. Catharina in Heusden (NB) from 1949-1950 by N. van der Laan and W.A.J. Hansen. Although Traditionalism was mostly a catholic direction in architecture, there are protestant churches in a Traditionalist style as well. This church, the Gereformeerde Noorderkerk in Bedum (Gr) was built in 1936 and was designed by E. Reitsma.